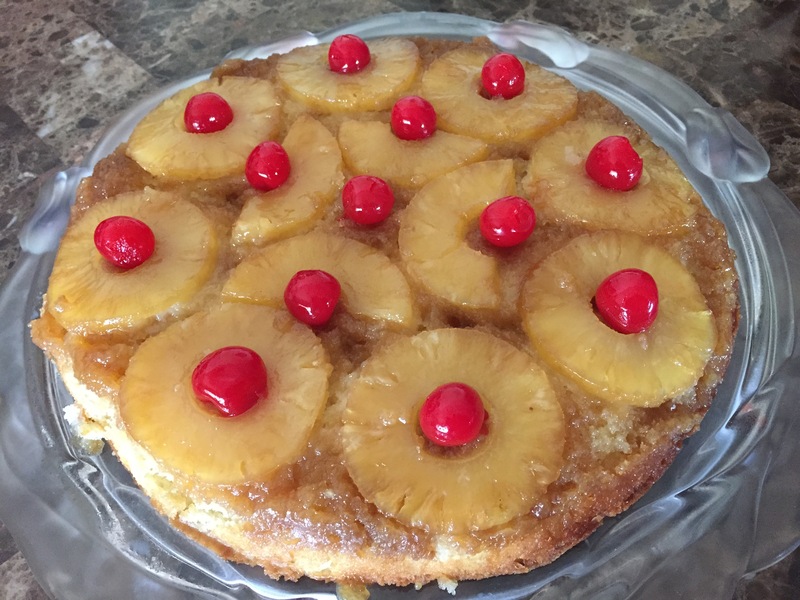 Father’s Day was yesterday and earlier in the week Chris had mentioned Pineapple Upside Down Cake so after cleaning up the dishes, and before we headed out, I made him his cake. He was one happy daddy and more importantly, he’s one heck of a dad to our girls. For that, I’m eternally grateful. Preheat oven to 350 degrees. On the stovetop, over medium heat, melt the butter in the cast iron skillet. Once melted, remove the skillet from the heat, sprinkle with brown sugar and top with pineapple slices. In a large bowl, beat the remaining ingredients until well blended. Pour the mixture over the top of the pineapple slices. Bake for 30-35 minutes or until toothpick inserted in the middle of the cake comes out clean. Remove from oven and turn over onto a heat-proof serving platter or plate. Allow to cool for a few minutes. Top with maraschino cherries and place in refrigerator until ready to serve.